The sycamore tree (Platanus occidentalis) is a deciduous hardwood tree found throughout the United States, especially in areas with moist, cool soil. It is also planted along highways and in many urban areas for use as a shade tree. This fast-growing tree is often used to make furniture and other specialty items, as the wood of the sycamore tree is tough and does not have a strong scent. One of the most obvious characteristics of the sycamore tree is its appearance. This tree is very large, reaching heights of 100 feet or more, with a canopy spread as wide as 70 feet. The trunk is sometimes split near the bottom so that the tree has two trunks. The bark is easily recognizable, as it is mottled in shades of gray, brown and cream. As a young tree, the sycamore is pyramidal in shape, but as it grows the canopy becomes more rounded and oval-shaped. The sycamore tree's fruit is a round orb that dangles from long stems. The leaves of the sycamore are wide and are usually between 4 and 6 inches long. The foliage is green but turns a yellowish color in the fall. The sycamore tree has certain growth characteristics. This tree thrives in rich, moist soil and is frequently seen growing along rivers, streams and lakes. However, this hardy tree can also grow in drought conditions. 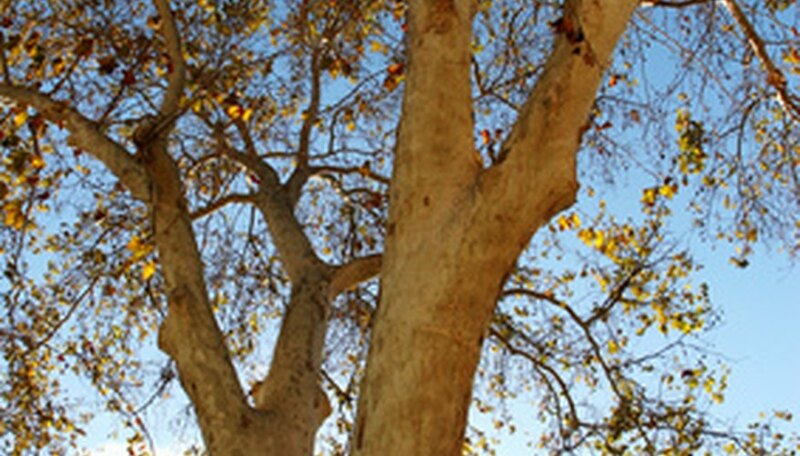 The sycamore tree likes full sunlight and is tolerant to salt and pollution. For this reason, it is often planted in cities. The roots are somewhat shallow, however, and can disturb sidewalks and other structures or pavement that is constructed around the tree. There are some characteristic problems that the sycamore tree can suffer. One is athracnose, which thrives in the cool, wet weather so attractive to these trees. This disease causes premature leaf drop, and it can affect and kill other plants. Sycamore trees also are subject to infestations by lace bugs, which will defoliate the tree. Bacterial scorch has been known to kill sycamore trees after only a couple of growing seasons. This disease causes the leaves to turn brown and shrivel up.